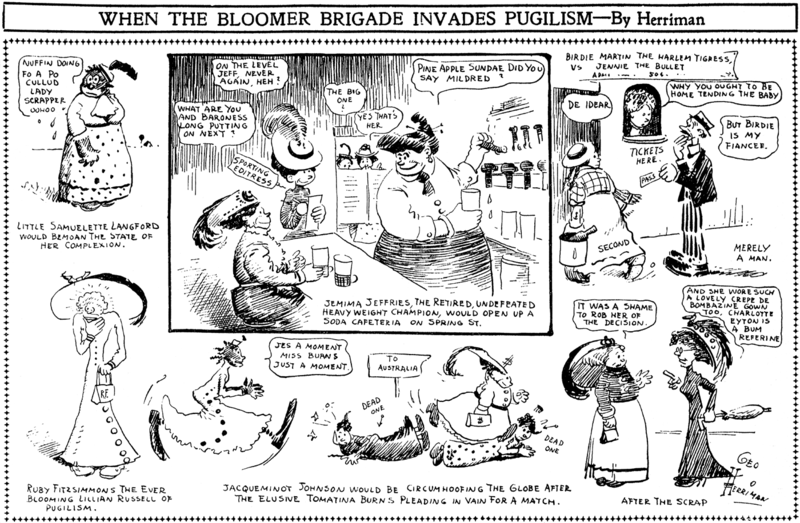 Tuesday, September 22 1908 -- Women reporters are starting to invade the sports realm, and Herriman responds by extrapolating that if they can report on sports, maybe they'll soon participate, too. The gags here all have to do with the current situations of the ladies' male boxer counterparts -- Jim Jeffrries, Tommy Burns, Jack Johnson, etc. Connie, October 2 1938, courtesy of Cole Johnson. Rex Hayden Maxon was born in Lincoln, Nebraska on March 24, 1892, according to his World War I draft card. The Lincoln, Nebraska Directory 1893 recorded the Maxon family at 1641 Poplar. The date of their move to St. Louis, Missouri is not known. The 1900 U.S. Federal Census recorded Maxon in St. Louis at 6719 Sixth Street. He was the youngest of three children born to Norris and Estella. His father was a bookkeeper. 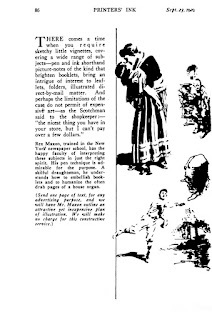 ERBzine.com profiled Maxon and said, "…When Rex was still a boy, his brother, Paul, and well-known artist-to-be, Clare Briggs, actually studied cartooning together….He spent much of his youth sketching the old river steamers on the Mississippi waterfront but his parents thought that one artist in the family was enough and encouraged him to become an electrical engineer. Rex stuck to his dream, however, and obtained a summer job during his high school years painting the river steamboats for the Government…." According to GenForum, at Genealogy.com, his brother Paul passed away October 14, 1898 in El Paso, Texas. In the 1910 census, the family remained in St. Louis but at 6618 Virginia Avenue. ERBzine.com said, "…He enrolled for private art lessons from J. LeBrun Jenkins and studied at the St. Louis School of Fine Arts. He later joined the staff of the St. Louis Republic newspaper…." Gould's St. Louis, Missouri Directory 1917 listed Maxon as an artist at 6012 Waterman Avenue. He was on his own by the time he signed his World War I draft card on June 5, 1917. He lived at 104 Waverly Place in Webster Groves, Missouri. His occupation was an artist at the Collier Advertising Company in St. Louis. He was described as short height, slender build with brown eyes and black hair. ERBzine.com said, "…Inspired by Republic colleague Hazel Carter who had moved to New York to work for Evening World paper, he moved east in 1917…." GenForum said they married April 23, 1919. In the 1920 census, the couple lived in Sea Gate, Brooklyn, New York on Nautilus Avenue. He was a newspaper artist and she was a newspaper feature writer. The Ethridge Association of Artists employed him, as seen in an advertisement, below, in Printers' Ink, September 23, 1920. Rex Maxon, trained in the New York newspaper school, has the happy faculty of interpreting these subjects in just the right spirit. His pen technique is admirable for the purpose. A skillful draughtsman, he understands how to embellish booklets and to humanize the often drab pages of a house organ. With the success of Hal foster's adaptation of Edgar Rice Burroughs' Tarzan of the Apes, Maxon was enlisted to do The Return of Tarzan. 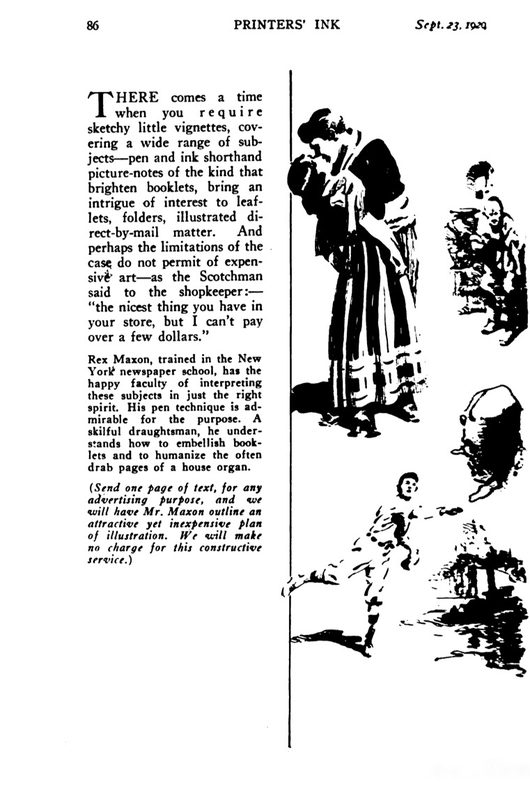 His strip began in the the Times-Picayune (Louisiana) on June 10, 1929 despite the advertisement's June 9 start date (below). 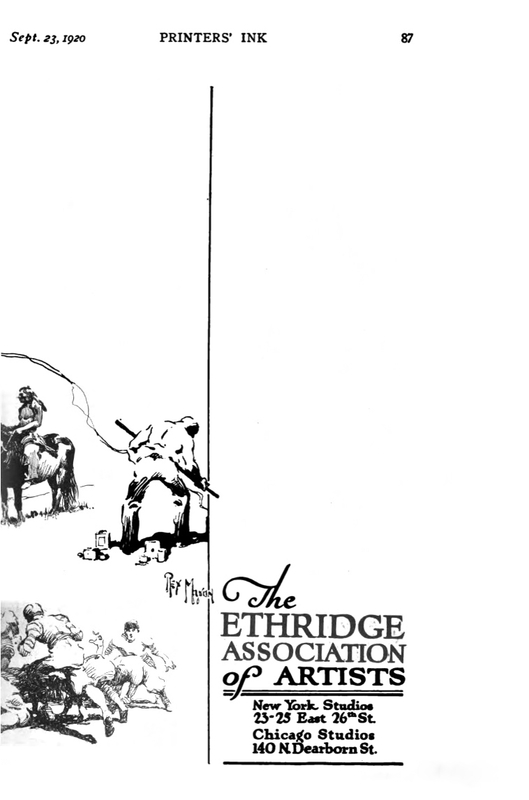 The entire 60-strip adaptation can be read at ERBzine.com. 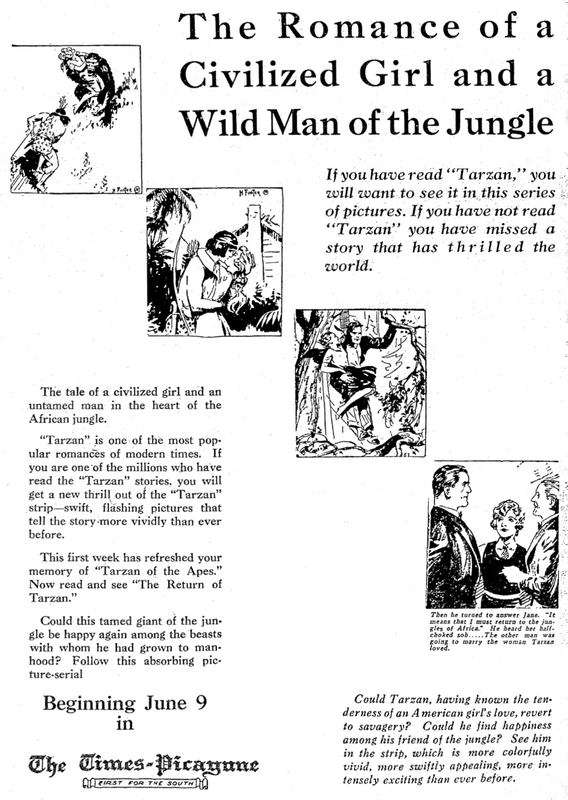 After Return a series of longer adaptations—14 to 21 weeks in length—appeared, based on nine more Tarzan novels. 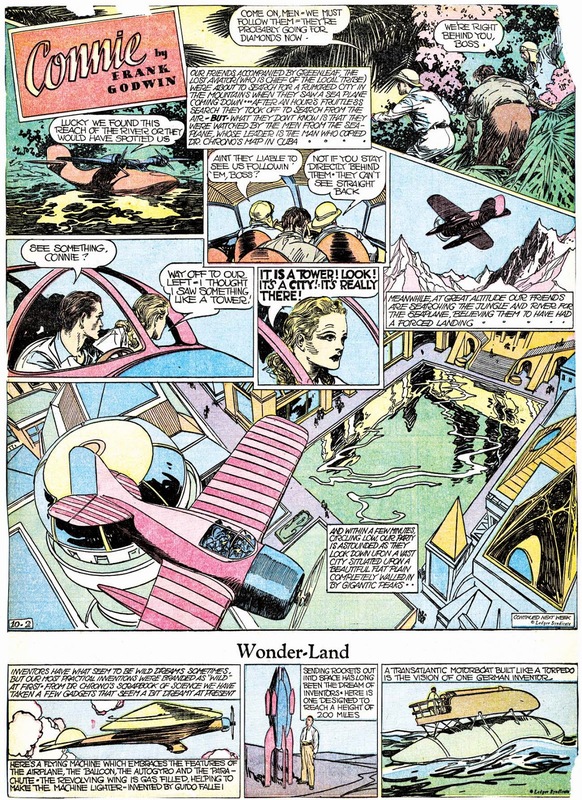 Each serial strip was fairly true to the Burroughs book from which it was adapted, but by the end of Tarzan and the Ant Men in June of 1932 there wasn't much left in the backlog of books to keep up the pace much longer. A crisis loomed — the Tarzan adaptations were in demand, and Burroughs material to adapt was nearly exhausted. What to do? In 1966 Rex Maxon told me that he had worked with "breakdown men" in preparing his Tarzan adaptations—at first George Carlin did the job, later Don Garden. 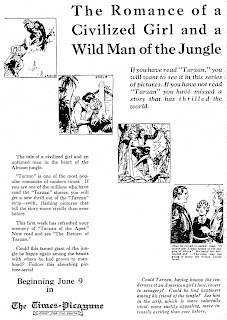 In mid-1932 Maxon and his breakdown man began the longest serial strip ever published—a 40-week adaptation of Tarzan the Untamed. And for the first time, the strip deviated seriously from the Burroughs novel: instead of the Kaiser-vintage German villains Burroughs had used, the comic strip featured Communist agents…. He left the Tarzan strip in 1947 and continued work in the comic book industry. Maxon passed away November 27, 1973, in Boston, Massachusetts, according to the Massachusetts Death Index, 1970-2003 at Ancestry.com. However, his death has been reported as November 25 in The World Encyclopedia of Comics (1976). An obituary has not been found. Links to his adaptations of The Beasts of Tarzan, The Son of Tarzan, Tarzan and the Jewels of Opar, Tarzan and the Lost Empire, Tarzan and the Golden Lion, Tarzan, Lord of the Jungle, Tarzan at the Earth's Core, Tarzan the Terrible, Tarzan and the Ant Men, Tarzan the Untamed, Tarzan the Ape-Man, Tarzan the Invincible, Tarzan and the City of Gold, and Tarzan and the Lion Man. Benton Harbor, 1920. Jack Dempsey is at his cyclonic best, savagely punishing his opponent Billy Miske. It won’t be long now...it can’t be…Miske is leaning toward the canvas while a hundred sport writers work like educated lightning, recording the last moments of a doomed fighter. But Thomas Aloysius Dorgan (Tad), the greatest cartoonist that ever sketched a prize-fight, seems strangely quiet. Hunched miserably in his ringside seat he can only wince with sympathetic pain whenever Dempsey’s glove thuds against Miske's tottering body. As a powerful blow sends Miske sprawling to the floor, Tad clutches at his heart—his “bum ticker” as he sometimes grimly called it—half rises in his chair and then collapses. He is carried out by his friends in Typewriter Row, revived, and put to bed. And never again did he see a prize-fight! Heart specialists told him that any excitement would be fatal, and though Tad had seen countless fights he had never learned to take them calmly. Fights were his special stimulant, as necessary to his happiness as trout are to President Hoover’s; yet at the age of forty-four these joys were denied to him forever. A wheel-chair, female attendance, and death-behind-the-door—a trio that he feared and hated beyond all describing—were his diet for the last eight years of his life. He was seen no more in the Broadway resorts that he loved; no longer was his stooped and lanky figure visible among ringside celebrities. Yet he kept on turning out his cartoons and his columns, adding the names of foreign capitals—Paris, Vienna, Shanghai—His admirers fancied him touring the world, but it was all a sardonic hoax. Actually he never left his back porch. Under momentary sentence of death, and in constant pain, he squeezed laughter out of the grimmest material ever handed a comedian to work with. He knew he was a pitiful failure in the two things he cared about most—boxing and drawing. He had wanted to be a boxer, but an accident ordained that he should spend his life drawing boxers. He might have been one of the world’s greatest caricaturists, ranking just below Hogarth and Daumier, but he was merely a syndicated cartoonist and “wise-cracker” (the highest-paid in America) hurling misanthropic epithets at his fellow-man. “Bonehead,” “nickel-nurser,” and “flat-tire” are original tokens of his esteem for humanity. For twenty years it was his humor to represent the human race as dogs. Yet he also had at his command the idealizing line that makes athletes seem glorious. George Bellows once said of Tad: “In catching the complex beauty of prize- fighters in action, T. A. Dorgan is without a rival.” A strange gamut, this Dorgan psyche. And a wretchedly unhappy one. “I want to be a scientific boxer like Jim Corbett” was Tad’s first ambition—and probably his last. So, as a lad of seven, he rigged up a cheap punching-bag, and took a bruising part in the daily fistic brawls that were an important feature of a young man’s education in the San Francisco of 1885. When little Tommy Dorgan wasn’t battling, he was drawing battles—ring battles of course. Having a taste for realism he always put blood in his pictures, and was constantly on the hunt for red crayons to indicate the “claret” in his masterpieces. The walls of the neighboring warehouses and livery-stables were covered with gory portraits of the great John L. Sullivan, Jake Kilrain, Charley Mitchell and of course the local pride Jim Corbett, who was at that time merely a stripling amateur. Suddenly a terrible accident marred this too-blissful existence of fighting and drawing. A house was being moved, and every kid “south of the slot” (the region in which Tad lived) was dodging around the workmen, watching the fascinating operation. While Tommy Dorgan with nine-year-old curiosity was investigating the windlass his hand got caught in the moving cable—and when he emerged from the ether, he faced the competitive struggle of life with only the thumb and first knuckle of his drawing hand left. But this cruel physical injury was as nothing compared with the consequent psychic handicap, familiar to modern psychologists as an “organic inferiority.” Actually, Tad’s deformity was scarcely noticeable, but there is no doubt that as he grew older it warped his social concept and powerfully affected his whole psychic life. It put him on the defensive; it made him bitter, caustic, domineering. It turned him into a wit, an aggressive wit, always anticipating a thrust by attacking first, constantly jabbing at mankind with a compensating lancet of disdain. Tad was rarely defeated in repartee; but if he was, he promptly snatched the button off the foil of good-humor and thrust his weapon into his rival's vital parts. He badgered the manager of the New York “Giants”—John McGraw—for twenty years, to to repay him for a single snub. 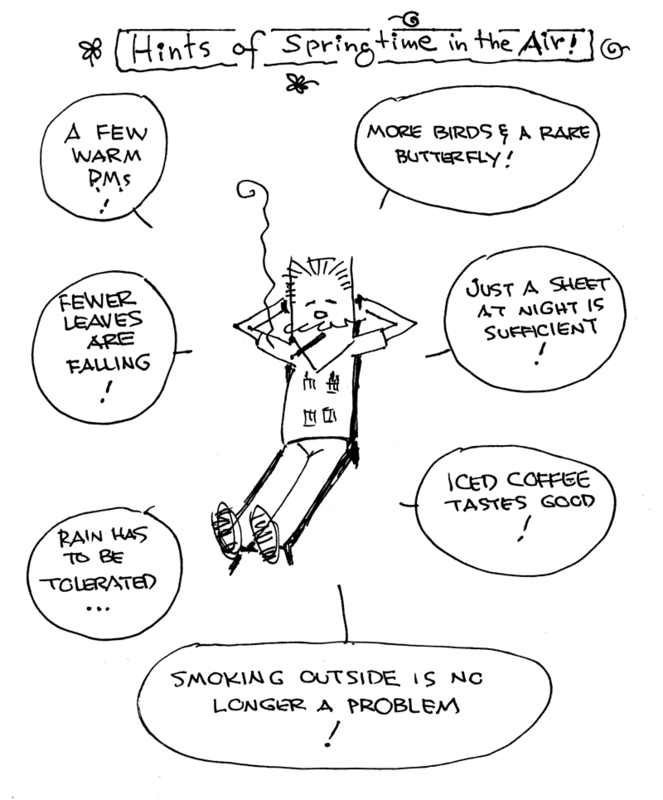 It is significant, also, that some one is always getting hurt in Tad’s cartoons. He was forever punishing this one or that, inviting us at the same time to jeer at the wriggling victim. And though Tad never realized it, the victim is often himself. His fondness for drawing the beautifully proportioned bodies of athletes is pitiful, if not pathologic. “Look,” he says as he sketches the balanced torso of Jack Johnson or Stanley Ketchel, “here is the thing I aspired to be, sound of heart and limb, splendid in action.” Then, as his thoughts returned to his own blasted hand and defective heart, how poisonous the rankling actuality must have been! Probably the biggest pugilistic event in Tad’s boyhood was the epic “battle of the barge,” a broiling grudge affair between Corbett and Choynski. The fight had twice been stopped by California police, but was at last fought to a finish on a barge floating in the middle of San Francisco Bay. Tad, barely fourteen years old, was probably the youngest of the spectators. He played hooky from school, rowed out to the barge in the gray dawn and hid under a coil of rope until the fight began at high noon. After twenty-eight rounds of what amounted to bareknuckle fighting, during which Corbett broke his left hand, Choynski took a smashing “left hook on the jaw” and fell to the deck. Many of the spectators were so excited that they toppled off the barge. Among these was young Tommy Dorgan, who was fished out of the water still yelling for Corbett. This battle made such an impression on him that he could describe it thirty years later blow for blow, and he always regarded it as the most dramatic fight he had ever seen. Soon after this ducking in San Francisco Bay, Tad found his first steady job. His father wanted him to be a bookkeeper, but Tad hated ledgers and routine. At no time in his life did he have regular habits of work, and in his cartoons he is forever poking ridicule at bookkeepers. What he wanted was a newspaper job, and he got one. He found a berth for himself as an office-boy in the art department of the San Francisco “Bulletin,” and for the first year his pay was three dollars a week. For the next it was nothing-at-all per annum. It happened this way: Tad’s humble task in the art department consisted of lettering, shading and drawing frames for the regular artist’s work. Once in a while he’d sneak in a picture of his own, which was so much better than his superior’s that vanity was wounded and jealousy born. As a consequence Tad found himself out of a job. But he came around to work the next day after he discharged, and the next day after, too; for a year he received not a cent of pay. Still he stuck to his desk, taking on any crumb of an assignment that came his way. In his idle hours (and there were plenty of them) he began to draw cartoons of local events and personalities which were so skillful [sic] that at last his boss had to relent and let them be published. In 1897 he was hired as the regular artist on the “Bulletin” at eighteen dollars a week. For this princely wage he was expected to double as a cartoonist and boxing editor. Needless to say, he combined these duties joyously; he had a brisk, staccato style in reporting his fights, and the ability to illustrate his copy with expert sketches. Kid McPartland, Joe Gans, Kid Lavigne and Frank Slavin are some of the old-time fighters that passed in review before his critical eye and his adroit pencil. Tradition says that Tad could reproduce from memory any important blow or series of blows in the major fights of Sullivan, Fitzsimmons, Corbett, Jeffries and Jack Johnson. Tad was the first sporting artist to depict the famous “solar plexus” with which Fitzsimmons laid Corbett low at Carson City. It was the original lucky punch, coming at the moment when Corbett had Fitzsimmons all but out, and for months the sporting world was astir with speculation as to exactly what had happened. Corbett himself didn’t know. Tad settled it once and for all by making a beautiful drawing of the “Freckled Marvel sinking a wild swing” into the pit of Corbett’s stomach. The picture was reproduced all over the country and gave Tad his first real taste of national fame. A quarter of a century ago the expression “23 Skiddoo” was on every one’s tongue. It was the equivalent of the more modern invitation to “take the air,” and was generally used in speeding the unwelcome guest. Tad is supposed to have picked it up in the following manner. The late Henry Miller was touring the country about 1900 with a dramatization of Dickens’s “Tale of Two Cities.” The climax of the play is the famous “knitting scene,” in which the knitting women audibly count the heads as they fall from the guillotine. They have just counted "twenty- two," when Sydney Carton walks across the stage to his execution. “He goes…now he is gone…twenty-three,” chant the knitting women as Carton’s head falls into the basket. By adding “skiddoo” (which is a form of the old American term “skedaddle”) to the fateful number, Tad coined a slang phrase that was widely popular for many years. 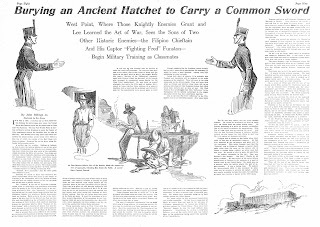 In 1903 Tad’s fame attracted the attention of William Randolph Hearst, who offered him seventy-five dollars a week to come east and be the political cartoonist on the New York “Journal.” Hearst was looking for a man of the Nast type to lampoon Tammany Hall, and particularly its boss Charles F. Murphy, in its conduct of New York City politics. Hearst had his eye on the mayoralty, and knew that he would need every possible aid in his fight against Tammany. He realized the power of a stinging cartoon, and was one of the first to recognize Tad’s rare talent. So the “Bulletin’s” young artist resigned and went east. “I landed in New York on the fringe of the good old days,” Tad once told me. “Broadway at that time was full of swell feed-joints, bars and hangouts. Now it is all movie dumps, sandwich stores, orange drink stands, hat shops and what not. What a crazy street it is now. But when I landed here a man could raise a thirst and satisfy it three times in a block.” Tad was always sighing for the “good old days,” and to any one who could raise a thirst as easily as Tad, these laments are quite understandable. In the New York city elections of 1905 Hearst ran against the Tammany candidate George B. McClellan, Murphy's special protege. The contest was one of the most exciting mayoralty fights in the history of the office, and it was exciting largely because of Tad’s powerful cartoons. He threw terror into the Tammany Tiger, by depicting Murphy in convict’s clothing, and McClellan as a puppet of the underworld boss. Murphy, it is said, tried to bribe Tad (as Tweed had tried to bribe Nast) to study art in Europe. But Tad, who had never taken a drawing lesson in his life, preferred to stay in New York. On the eve of election Hearst came into the “Journal’s” art room and told Tad that his cartoons had cut the Tiger’s tail off! And they come very near it. When the ballots were counted, Tammany had a bare margin of three thousand votes—the smallest plurality in the history of New York elections. After the election, Hearst abandoned for a time his political ambitions, and Tad went back to his first love—sport cartoons. A dark star of the first magnitude was hovering over the boxing world at that time. Jack Johnson had just whipped Tommy Burns for the heavy-weight championship, and there was no white rival to wrest the crown from Johnson’s kinkey head. It was Tad who created the term “white hope” and virtually stung Jeffries into the ring again. Tad considered Johnson the most perfect physical specimen he had ever seen, and never wearied of drawing the colored champion in action. He nicknamed him “L’il Artha” and was frankly overjoyed when he whipped Jeffries. But white or black, Tad could never resist a tale of woe from a broken-down prize-fighter, though he was not conspicuously loose with his money. But such a gesture probably nourished the craving for superiority, so necessary to his defensive psyche. For the same reason he preferred the company of men lower in the social scale. He loved to associate with bartenders, touts, and training-camp hangers-on. Naturally, he dominated them with his caustic tongue, just as he dominated (or quarreled with) most men with whom he came in contact. He had to be the protagonist in every social drama, and he simply refused to play if a more magnetic personality assumed the leading role. His ungrudging admirations were rare, indeed were reserved for two men whom he instinctively felt to be his superiors—Arthur Brisbane and James J. Corbett. Brisbane is almost the only instance of conceded intellectual superiority. Tad often said that Big George (that was his nickname for Brisbane) was the only literary man he ever knew who could think in terms of pictures. But this was only one of the reasons why Tad admired his chief; there were other, less tangible influences emanating from him—influences that kept Tad at work, kept him sober and kept his courage from buckling in the pinches. As for Brisbane, he declared that Tad was a genius, had a marvelous knack for language, and that a great writer had been spoiled when Tad turned cartoonist. Corbett’s influence on Tad was the happiest of all. Not only was “Gentleman Jim” the prototype of all that Tad admired, but he was also the connecting link with the early days in San Francisco. Tad’s longing for the “good old times” was completely satisfied by Corbett’s rich personality and fund of reminiscence. Together they would laugh over the old names, weep over the old pictures, and swear that the present age was stale, flat and degenerate. They needed each other, they never lost each other. But they never knew each other. Corbett was a beautiful myth to Tad, and Tad was a delightful mystery to Corbett. “He was always cheerful, always smiling,” says Gentleman Jim when you ask him about his life-long friend. The answer is, of course, that he was “always cheerful, always smiling” when Corbett was around. And rarely at any other time. It was Dorgan’s affectation to despise what he considered affectation of any kind, especially if it veered toward elegance or refinement. He rejected the ordinary social amenities and simply could not tolerate what he considered the over-studied in dress, deportment or language. He himself had a positive flair for wearing grotesque and cast-off clothing. He hated what he called “two-dollar words.” and “high-hat” manners. Unreasoned prejudices against certain brands of cigarettes would lead him to insult any one he saw smoking them; these prejudices extended to motor-cars of certain makes, most restaurants, many types of straw hats, overcoats and so on. His racial antipathies were most vigorous, and he had to be on his guard constantly lest these hatreds slip into his daily cartoons. A person who carried a cane or used a cigar or cigarette holder was anathema. And if you tried to reason him out of these prejudices he would walk away in a rage, and thereafter include you in the category of the damned. When Gene Tunney lectured on Shakspere at Yale, Tad was disgusted. “No matter how thin Tunney cuts it,” he remarked, “it will still be boloney.” Then he added, “Tunney thinks too hard—but not hard enough.” To Tad, thought came with the rapidity of a switched-on current; plentifully too, for he never was at a loss for ideas. He once said, “I’d rather have a nice fruit-store and sell fruit than sit all day wondering what to draw a picture about.” Until he was twenty-five he had never heard of Napoleon; at no time in his life could he bear to read Shaw, Ibsen, Wells, Zane Grey, Sinclair Lewis or Shakspere. “Wind and vinegar,” he called them. Yet this hard-boiled newspaper cartoonist whose credo was “make it short and snappy,” loved Charles Dickens, and read his novels over and over. “David Copperfield,” “A Tale of Two Cities” and “Nicholas Nickleby” were his favorites. Oddly enough the only woman novelist he ever enjoyed reading was Jane Austen. “She was an operator before women ever got driving licenses,” is his characteristic commentary on the author of “Pride and Prejudice.” And as usual, Tad’s slang pot-shot quivers within the bull’s-eye. Many of Tad’s admirers have wondered how he kept in touch with the sporting world and continued to draw pictures for eight years after he was confined to the house. Tad had two Chinese boys [Wong Ho and Wong Hong Kee whose nickname was “Spensi”] whom he and Mrs. Dorgan adopted years before. After his heart attack in 1920 Tad began to train one of these boys—“Duck,” he called him—to go out in the highways and byways of sportdom and gather material. So “Duck” went to all the baseball games and prize-fights, billiard matches and sport jamborees, acting as eyes and ears for Tad. He would come back from a fight and reenact the battle blow by blow, for even under the most exciting conditions he didn’t lose his head. One of the most thrilling things I have ever listened to was “Duck’s” description of the Dempsey-Firpo fight. It was his careful analysis of the blow that sent Dempsey out of the ring that enabled Tad to make a superbly realistic drawing of an event he had never seen. He borrowed his material from the barber-shop, the pool-room, the boarding-house and the saloon, diverting a word or an expression to his purpose whenever he caught its universal overtones, or saw possibilities in a concealed core of language. “Finale-hopper,” he got directly from his own cook. It was a scornful expression which she applied to a certain young man of her acquaintance who was too stingy to pay his way into a dance-hall, and stood around the door till the last dance. When the ticket-taker left, the finale-hopper made his entrance, and got the last dance free. Tad saw that the species was general, and joyously put the phrase in circulation. “Cake-eater,” “lounge-lizard” and “drug-store cowboy” are slang chips off the same block. “Applesauce” means a camouflage of flattery, and is derived from the boarding-house trick of serving a plenty of this cheap comestible when richer fare is scanty. To give a person the "once-over" is to eye them casually; it was known for years as a barber-shop expression. To Tad, an overcoat was a “benny” (possibly because it is left with “Uncle Ben”—the pawnbroker—during the summer months). A hat was a “skimmer,” and shoes were “dogs.” Both of these expressions are traceable to the “thieves patter” mentioned by George Borrow in “The Romany Rye.” “Storm and strife” a metaphorical jape meaning “wife,” is from the same source, though Tad never heard of George Borrow’s existence. “See what the boys in the back room will have,” is a bar-room classic; “the first hundred years are the hardest,” might be a stoical expression of Dorgan’s own philosophy; “Officer, call a cop,” “Let him up, he’s all cut” and “Yes, we have no bananas” are examples of the meaningless but irresistible phrases that Tad delighted to coin, or appropriate to his own use when he heard some porter, fruit-dealer or truck- driver uttering them. T. A. Dorgan was at his best when he was exposing the hypocrisy of the lower middle classes. But the task of pleasing (that is, not offending) a daily audience of ten million, necessarily diluted the vitriol on his pen. He was held in check, too, by a very large salary, and could only press lightly where he would have preferred to bear down. Even so, he is among the first of our graphic satirists, his “Indoor Sports” furnishing an acid commentary on certain meaner aspects of our national life. It has been reported that Dorgan remained cheerful until the end, and most of our newspaper accounts have revamped the old “laugh, clown, laugh” formula for his passing. That is sheer romance. During the last eight years of his life he was always in pain; his resulting irritability and depression can be readily understood and entirely excused. How could he have been cheerful? He felt, with entire justice, that life held nothing more for him, yet he was unwilling and perhaps afraid to die. So in a restless fury he sat at his radio, twirling the dial in and out of a dozen stations in the same minute. It required all the tact and resource of a devoted wife to bring him out of his desperate moods; toward the end her bravest efforts were unsuccessful, and nothing could appease him but work. He plunged into his daily stint with feverish gratitude, for here at least he was the master and critic of life. For months before the end he was on the flat of his back, yet he kept at his drawing-board, turning out his daily cartoons and manufacturing new slang with every failing breath. He died, May 2, 1929, with his pencil in his hand, his work two weeks ahead of publication schedule. 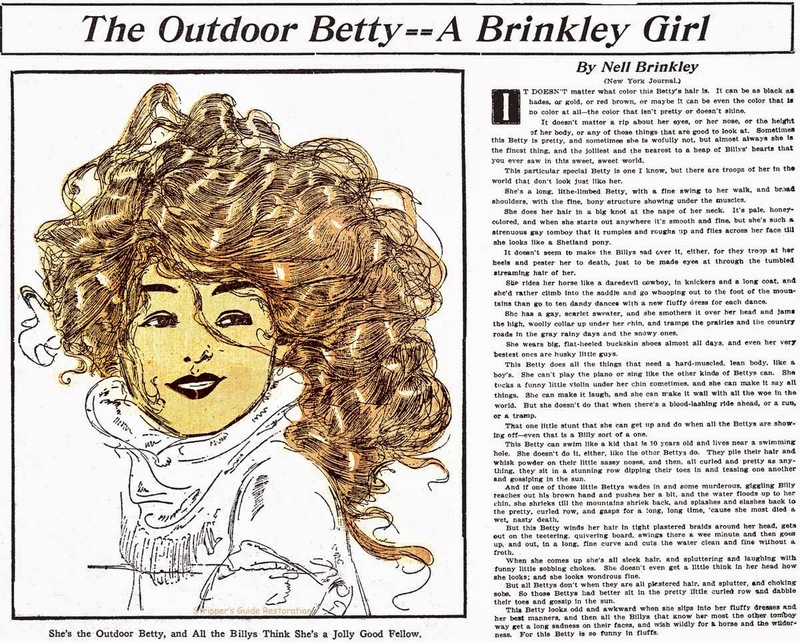 Nell Brinkley's prowess with pen-and-ink as well as typewriter propelled her into the big-time in very short order. 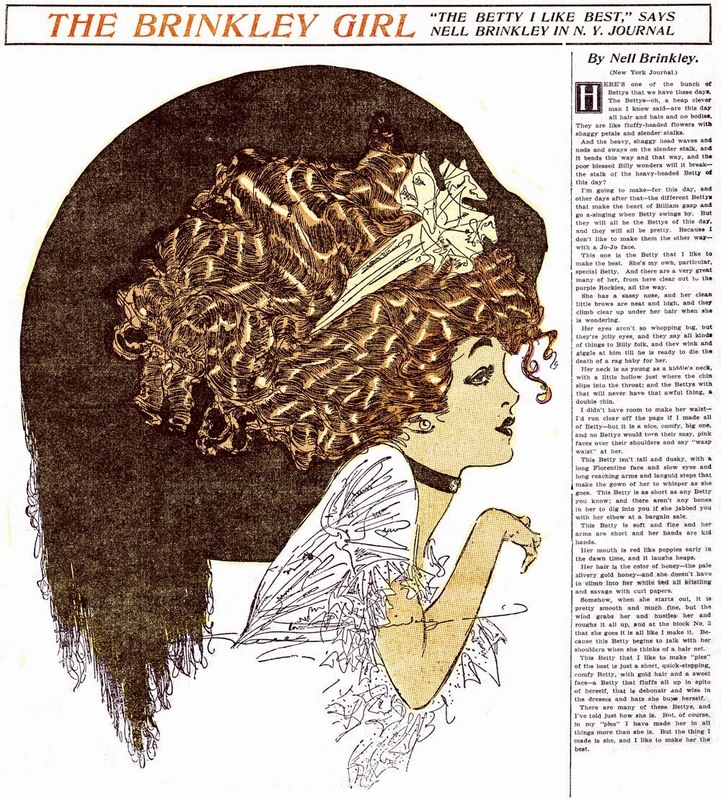 In 1907 she began making drawings for her hometown Denver Post, and before the year was out, she was in New York City, with a contract in hand from William Randolph Hearst. 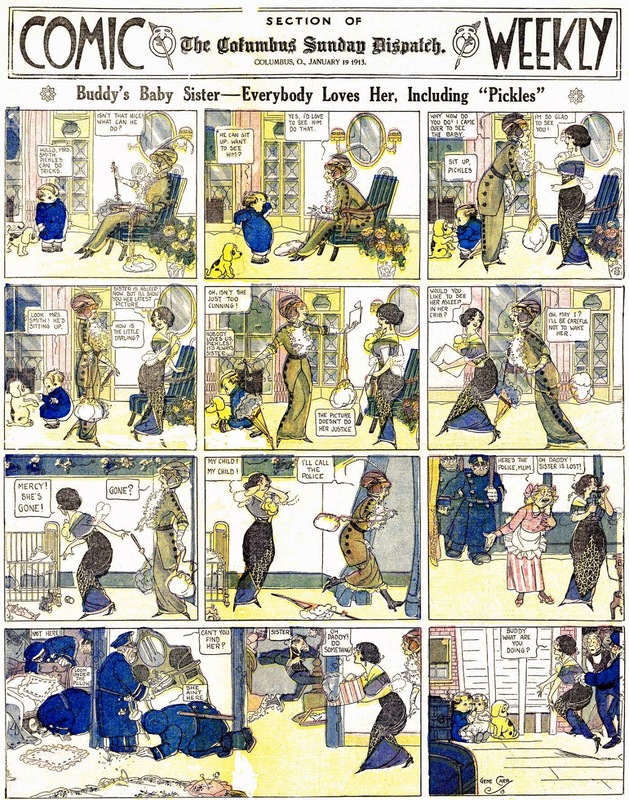 By 1908 her illustrationas and accompanying essays were in newspapers all over the country. Above are some examples of her work in 1908. Don't ignore the essays -- they are quite interesting, and help to explain her popularity. She had a self-affirming message to women, telling them that they could be beautiful and desirable whether or not they measured up to her drawn ideals. For men who often sheepishly read her work in secret, they were treated to an insiders look at how the female mind works. Brinkley's honest and unfiltered rambling thoughts were invaluable lessons to men in those buttoned-up days when the average guy was completely mystified at what made women tick. Gene Carr was a real maestro of the comics page, in that he could adapt himself to anything from dizzy slapstick to serious adventure. He is best remembered for his feature Lady Bountiful, but his contributions to the form are so much greater than that one strip. 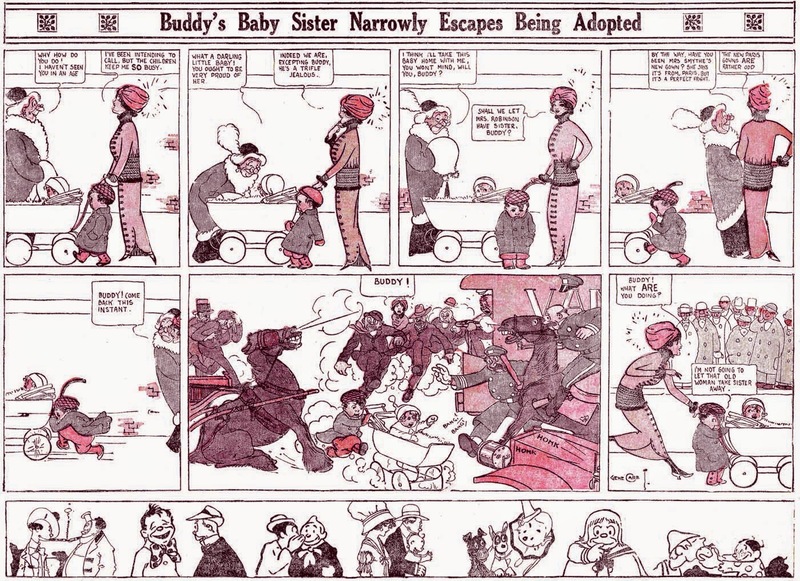 A forgotten gem by Carr is Buddy's Baby Sister, a strip which could have been, but wasn't, recognized in 1913 as a groundbreaking new way to derive humor in the funnies, based on psychology rather than pratfalls. Although Carr still included physical humor in the strip, the real subject is the psychological torture endured by poor Buddy, who is a prototypical Charlie Brown type forty years or so before Peanuts.It really is an amazing strip, so far ahead of its time that I'm amazed it failed to make more of an impact. The empathy Carr has for this kid, and which he communicates in a beautifully understated manner, is unlike almost anything else you'll come across from the era, especially in the full-throttle slapstick pages of the Sunday color funnies. Thanks to the late Cole Johnson, who supplied these scans. 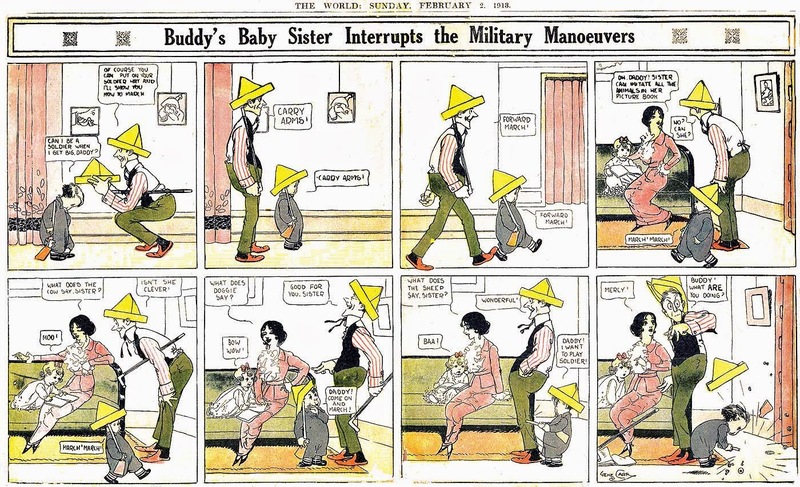 It could be that in 1913, though there were a lot of strips with frustration as a theme, one without humor, and just a little vignette of pathos instead would be hard to attract many fans. Iced coffee... just a sheet at night... two things not to take for granted!